According to a recent poll, 10 percent of people around the globe worried that the world will end on Dec. 21, 2012, as some spurious interpretations of the Mayans' long-count calendar predict. The doomsayers cite several different potential agents of apocalypse, including a collision with the supposed rogue planet Nibiru, a catastrophic solar storm or an unfortunate planetary alignment. But it's all nonsense, NASA assures us. Here's a look at some of the most prevalent 2012 doomsday myths, and some NASA-provided reasons why we shouldn't retreat into our bunkers. If Nibiru or Planet X were real and headed for an encounter with Earth in 2012, astronomers would have been tracking it for at least the past decade, and it would be visible by now to the naked eye. Obviously, it does not exist. Eris is real, but it is a dwarf planet similar to Pluto that will remain in the outer solar system; the closest it can come to Earth is about 4 billion miles. There are no planetary alignments in the next few decades, Earth will not cross the galactic plane in 2012, and even if these alignments were to occur, their effects on the Earth would be negligible. The Earth and sun align with the approximate center of the Milky Way galaxy every December, but that is an annual event of no consequence for us. Solar activity has a regular cycle, with peaks approximately every 11 years. Near these activity peaks, solar flares can cause some interruption of satellite communications, although engineers are learning how to build electronics that are protected against most solar storms. But there is no special risk associated with 2012. The next solar maximum will occur in the 2012-2014 timeframe and is predicted to be an average solar cycle, no different than previous cycles throughout history. A reversal in the rotation of Earth is impossible. There are slow movements of the continents (Antarctica was near the equator hundreds of millions of years ago, for example), but that is irrelevant to claims of reversal of the rotational poles. However, many of the disaster websites pull a bait-and-switch to fool people. They claim a relationship between the rotation and the magnetic polarity of Earth, which does change irregularly, with a magnetic reversal taking place every 400,000 years on average. As far as we know, such a magnetic reversal doesn't cause any harm to life on Earth. A magnetic reversal is very unlikely to happen in the next few millennia, anyway. Earth is no stranger to volcanic eruptions, or even the rare supervolcano blast. But will a supervolcano end the world on Dec. 21, 2012? Don't hold your breath, NASA says. 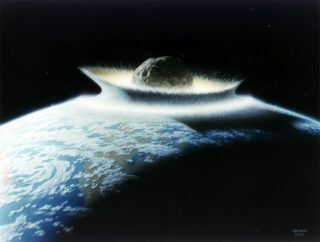 Earth has always been subject to impacts by comets and asteroids, although big hits are very rare. The last big impact was 65 million years ago, and that led to the extinction of the dinosaurs. Today, NASA astronomers are carrying out a search called the Spaceguard Survey to find any large near-Earth asteroids long before they hit. We have already determined that there are no threatening asteroids as large as the one that killed the dinosaurs. All of this work is done openly, with the discoveries posted every day on the NASA NEO Program Office website. So you can see for yourself that nothing is predicted to hit in 2012.